This exquisite lamb dish was provided by The Hess Collection. A very special thank you to The Hess Collection for sponsoring this post and providing this wonderful wine. In my opinion, few meals are as impressive to serve or as pleasurable to prepare as a rack of lamb. 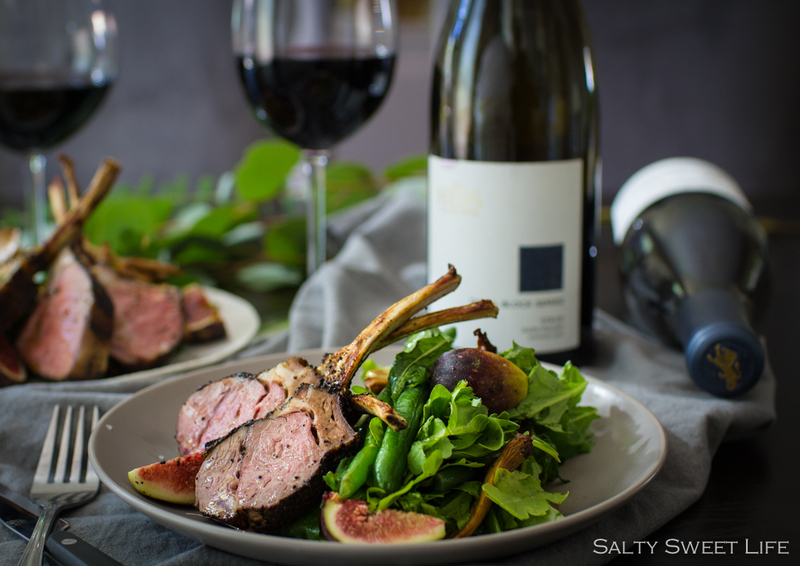 Lamb is always accompanied by the feeling that “something special is happening” and I usually reserve it for special occasions: Valentine’s Day, anniversary dinners, or birthdays. I remember when I was young, and my brothers were little, my mother would buy a tiny package of lamb chops and squirrel them away for a rare, quiet morning when she could make them for her breakfast–always with a sunny-side up egg and a side of buttery, steaming grits. My picky little brothers would have sooner eaten soil than that exquisite meal, but I knew better and would hover around the kitchen, hoping that she’d save a bite of lamb chop for me. I suspect those lamb chop breakfasts were few and far between because the lamb was (and still is) very expensive and because of that, I still approach lamb with a bit of hushed reverence. 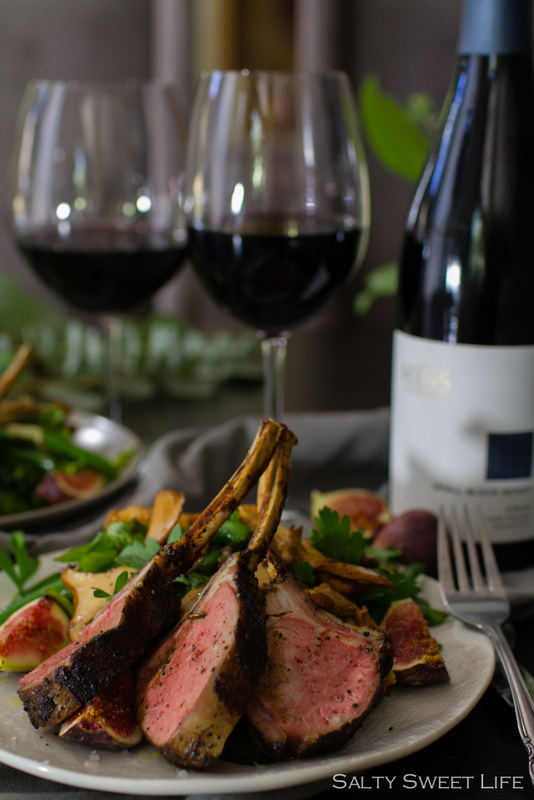 That reverence came into play when I was given the opportunity to make and photograph an amazing recipe for Coffee and Herb Rubbed Lamb Chops with a Chanterelle Mushroom, Fig and Haricot Verts salad to pair with The Hess Collection’s Small Block Series 2012 Syrah. 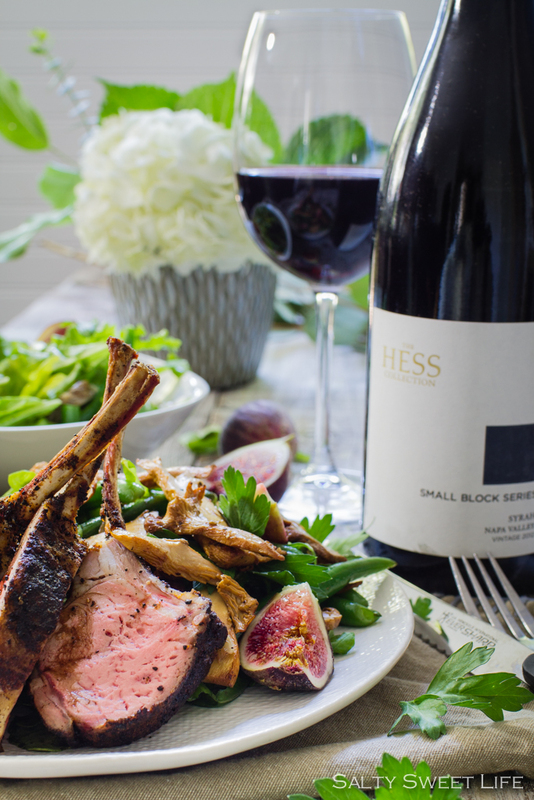 The Hess Collection Small Block Series Syrah‘s full-bodied, blueberry and black cherry notes accented with vanilla and spicy clove pair perfectly with the tender, spice-encrusted, Icelandic lamb chops. The Chanterelle, Fig and Haricot Verts salad has as much complexity as the lamb chops with its combination of peppery arugula; earthy, caramelized Chanterelle mushrooms; jammy, fresh figs and crisp-tender haricot verts, drizzled with a simple balsamic vinaigrette. This elegant dish and bold, rich wine is a perfect pairing for a special holiday meal. I absolutely loved the smokiness imparted by the coffee and herb rub, which, in turn, brought out the sweetness in the Small Block Series Syrah. 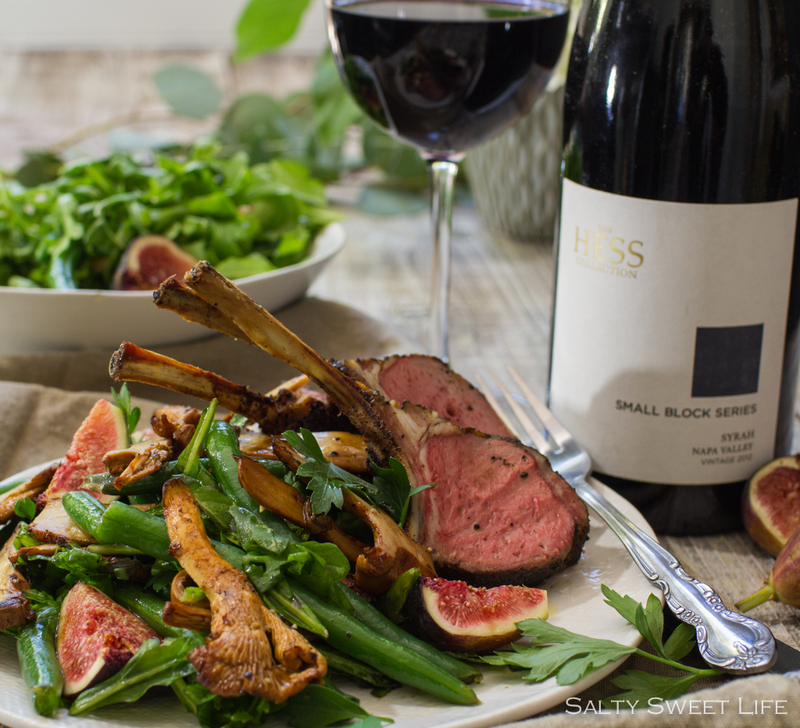 The rich, umami of the mushrooms made the salad the perfect counterpart to the lamb and the wine. Chanterelle mushrooms can be quite expensive and are sometimes difficult to find. Feel free to substitute another type of mushroom if you desire. I used a combination of chanterelles and oyster mushrooms and the salad was just as wonderful. Use a meat thermometer and remove the lamb chops from the oven when they reach an internal temperature of 125 degrees. The lamb will reach 130 degrees while it rests and the meat will be cooked perfectly to medium-rare. Season the lamb racks with salt and pepper. Let sit for 15 minutes or longer. Combine coffee, paprika, oregano, thyme, brown sugar, mustard, pepper, coriander, cayenne and salt in a small bowl. Sprinkle generously over the lamb racks. For the salad: place the garlic and olive oil in a small sauté pan. Cook over low heat until the garlic is translucent and soft – approximately 5 minutes. Drain well, reserving the garlic and oil separately. Heat a sauté pan over medium high heat. Add one ounce of the reserved oil and heat until shimmering. Add the mushrooms and sauté until the mushrooms are slightly caramelized and cooked through. Season with salt and pepper and place in a large bowl. Add the garlic, haricot certs, arugula and parsley. Season with salt and pepper. Combine the balsamic and all but 1 tablespoon of the remaining olive oil. Whisk well and adjust seasoning. For the lamb racks: Heat a sauté pan over medium heat. Add 1 tablespoon reserved oil and the lamb racks. Cook over medium heat to brown all over, being careful not to burn the spices. Place the seasoned meat on a rack in the preheated oven. Cook until an instant-read meat thermometer reached 130 degrees. Transfer to a platter, tent with foil to keep hot and rest for 10 minutes until ready to serve. To serve: dress the salad with the balsamic vinaigrette, then add the figs to the salad and gently toss. Slice the lamb in 6 pieces (3 per rack). Place a spoonful of the mushroom salad slightly off center on the place. Lean the lamb chops against the salad and drizzle with any remaining vinaigrette. Disclosure: This post was sponsored by The Hess Collection. If you would like to discover this fine wine as well as others from The Hess Collection for yourself, they have generously offered a special discount for my readers! Use the code THCBLOG when you order to receive 20% off your purchase. Cheers! The lamb looks so great, Tracey! Beautiful presentation. Wow! All of it looks and sounds so delicious. Your photography is exquisite. Thanks so much for the great compliment, Michelle! It really is a wonderful dish! Lamb chops are such a treat. Little lollipops of love. Now about your photography…. breath taking. Your pictures are so inviting and truly captured all of those wonderful ingredients. The Syrah sounds like a really nice match for this dish too. Love it all. Hi Libby!! Thank you so much for that great compliment! The Syrah is really wonderful–so great with spicy foods! Yummy Traci! Hope you’re back to blogging? Hey sweet girl! I’ve missed you and all my blogger friends! How have you been doing?? What an amazing meal! We love a nice lamb. I will definitely be looking for this wine too. We love a great Syrah! Great to see you Tracey! It’s great to see you too, Julie! I’ve missed you! I hope you can find the wine–I’m definitely a fan! One more thing, I’m about to add a discount code for the wine this evening, so check back for it! 20% off! Awesome! Email me and let me know how you got that gig! This is a fantastic and elegant looking dish! Absolutely gorgeous!! Just wish we could sit down and enjoy it together!!! Wow! These photos are just beautiful Tracey. I also was the kid who would hover around the kitchen for the “good stuff’. Bravo!